A national coalition of advocacy groups is calling for major reforms to Canada's foreign caregiver program in hopes of improving working conditions and offering a more reliable path to permanent residency. A national coalition of advocacy groups wants major reforms to Canada's foreign caregiver program in hopes of improving working conditions and offering a more reliable path to permanent residency. A new report published on Sunday features personal stories of hundreds of care workers who have struggled with family separation, difficult, and at times, abusive work environments and a complex bureaucracy. "Women like us have been coming to Canada for over a century, raising children, taking care of the sick and the elderly, being the backbone of the economy, and yet we are treated like we are temporary," Kara Manso, a co-ordinator with the Toronto-based Caregivers Action Centre, says. The demands come as the federal government prepares to review pilot programs for foreign care workers that were initially rolled out in 2014 as Ottawa looked to update its policies. They are set to expire in November 2019. According to the report, the current regime was developed "without consultation, input or direction" from care workers. "This program is fundamentally flawed and extends the legal basis for exploiting care workers," it says. The coalition of groups from across Canada are calling for a new federal workers program that offers permanent residency to foreign caregivers as soon as they arrive. That would allow them to bring immediate family members, who the coalition hopes will be offered open work and study permits under a new program. "Family unity is the norm for many other temporary immigration programs and it results in improved health and stronger families rather than years of forced separation," the report states. Care workers be able to apply for permanent residency after one year of work (1,950 hours), rather than after two years of work. Caregivers be given open work permits so they have the option to leave abusive work situations or find a new employer if their current one passes away. More stringent educational requirements be removed. Currently, care workers must have the equivalent of one year of Canadian post-secondary education to apply for permanent residency. Their arrangements, however, often prevent them from having time to study and complete courses. English language requirements be removed. These were introduced with the 2014 pilot programs. Remove caps put on the number of annual applications for permanent residency from foreign caregivers. The hard cap on permanent residency applications is currently set at 2,750 for those working under in childcare, and 2,750 for those caring for those with "high medical needs." "In 2016, 4,861 migrant care workers were issued a new permit in the childcare stream and 5,335 in 2017. This means that nearly half of us that came to Canada in 2017 will be rejected on the basis of the annual quota, despite the promise that if we worked for two years we could apply for permanent residency," the report says. "We thought we had a promise with Canada. That if we worked hard, even in the face of discrimination and abuse, we would eventually be able to reunite with our families, bring them here and live here safely and with permanent status." Indeed, beyond the hard cap, there are a host of others ways care workers can miss out on a chance for residency. Sometimes issues with employers unwilling to simply fill out paperwork can lead to major problems. 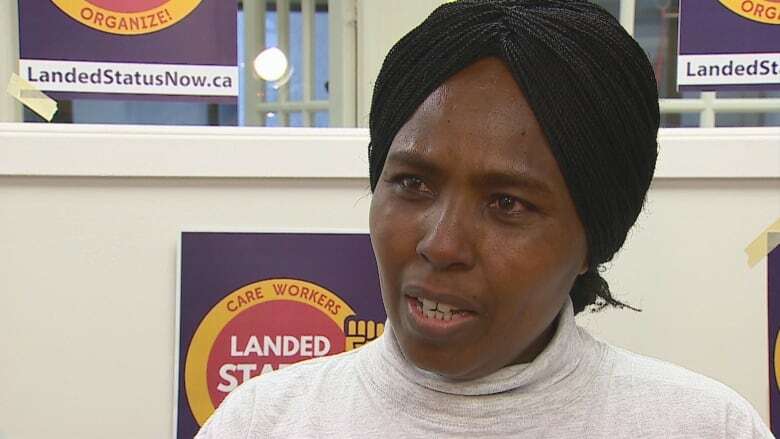 Winnie Waithira came to Canada from Kenya in 2014 to work as a caregiver. "I decided to come to Canada to change my life and also to support my children," she said, adding that some weeks she would work every day for up to 12 hours. 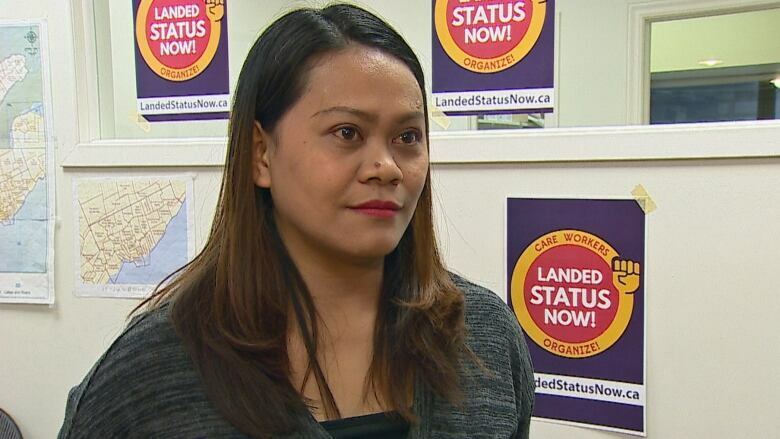 She earned only $300 per month, and says she effectively lived out of a suitcase for years while she worked toward enough hours to apply for permanent residency. "I felt so bad in my heart, and I choose to work," she explained. "My dream was to work hard, and some day to bring my family to Canada." But four years and one broken relationship with an employer later, Waithira has been left waiting for permanent status after he refused to sign the paperwork certifying that she completed the two years of work necessary for an application. The advocacy groups say her story is hardly unique, and represents how employers ultimately wield undue power of the future of care workers.